Shipshewana is drawing summer crowds with Weaver Furniture Sales, a store offering Amish dining tables and chairs, and a variety of music and craft events. These events appeal to the entire family and draw on Amish tradition. Visitors seeking a taste of the “simple life” in Shipshewana, Indiana are growing in number as we move deeper into summer. Weaver's Furniture is drawing visitors with an Independence Week Sale on all in-store furnishings and a massive quilt garden featuring brilliantly-colored blooms arranged in a striking pattern. However, a variety of upcoming arts-and-craft experiences are sure to draw visitors this summer. The Shipshewana Quilt Festival – Not to be confused with the “Quilt Garden Tour,” this festival was named one of the “Top 100 Events” in North America and features a nationally-recognized speaker (Wendy Butler Burns), quilting workshops, vendor shows and a quilt garden tour. The festival runs daily from June 26 through June 29, 2013. The Aromatherapy Sensory Tour – Discover the power of aromatherapy and how to incorporate this art into your daily life for peace of mind and rest. Sample a wide selection of aromatic elements, including natural and rare fragrances, and go on a sensory adventure. This event runs June 26 through June 28 from 10:00am-5:00pm. Summer Art Class: Moonlight Summer Camp – Hosted by artist Carl Mosher at the Maple Wood Nature Center, guests will have the opportunity to learn first-hand how light shines on background and foreground objects. This unique experience joins together the beauty of nature with the artistry of paint in one special event. This event is exclusively on June 29 from 9:30am-2:30pm. Visit Shipshewana and experience a variety of arts, crafts, entertainment, food and shopping. As Weaver's owner LeRoy Weaver remarks, "These events appeal to the entire family and draw on Amish tradition," including developing artistic skills (such as quilting, painting or woodworking), and simply learning about the history of the Amish in Indiana and of Shipshewana Amish furniture. To learn more about these and other Michiana Amish Country area events visit http://www.backroads.org. Weaver Furniture Sales was established in 1989 in Shipshewana, Indiana, and is an Amish, family-owned furniture business that offers a full line of solid wood, Amish Furniture at affordable prices – for both residential and commercial purposes. Weavers features shaker styles, traditional and mission furniture. 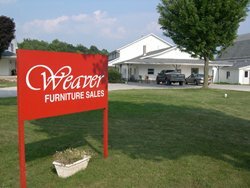 As part of their client services, Weavers provides furniture design consultation services, custom furniture options, furniture quotes, layaway options and various delivery alternatives for residences and businesses in the United States from their quiet country showroom in Shipshewana, Indiana. LeRoy and Ida Weaver have owned and operated Weavers for almost twenty-four years, beginning with a 1,500 square foot showroom and expanding to over 15,000 square feet today. Previously, they owned and managed LeWana Dairy Farm where they milked cows and raised corn and hay.